fiberglass conduit made of highly corrosion-resistant resin can withstand most of the acid, alkali, salt water, untreated sewage, corrosive soil or groundwater erosion and many chemicals. fiberglass conduit at -30℃state, still has good toughness and high strength, long-term use in the range of -50℃-80℃, the use of special formulations of the resin can also be used at 110℃. 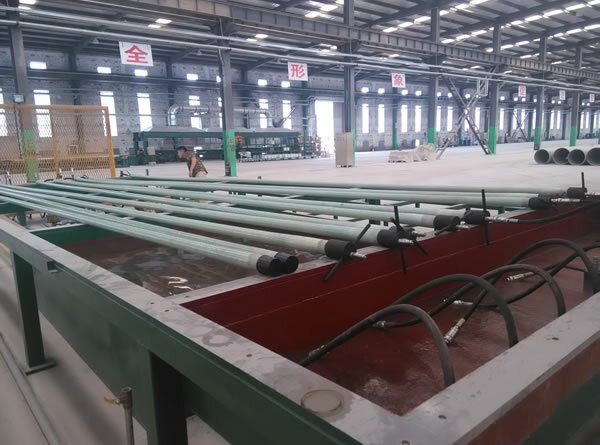 fiberglass conduit wear resistance is very good, the test proved: the water contains a lot of mud, sand, into the tube rotation wear impact comparison test. After 300,000 rotations, the inner wall of the pipe wear depth detection is as follows: with tar and porcelain oil coated steel pipe is 0.5. 53mm; steel surface hardening treatment is 0. 48mm; glass pipe is 0. 21mm, which can explain the wear resistance of the glass pipe is very strong. FRP sand tube wall is smooth, in the course of non-fouling, no rust, will not be in the sea or sewage shellfish, fungi, and other microorganisms stain adhesion. Five, high installation efficiency, less interface. Shandong Sheng bao Glass Fiber Reinforced Plastic Co., Ltd. production of sand glass pipe, its specific strength (strength / specific gravity) is 2-3 times the alloy steel, according to the different requirements of users, designed to meet all types of internal and external pressure to withstand the requirements of the pipeline, transportation and installation is also very convenient. fiberglass conduit can be based on the user's various special requirements, by changing the design, to create a variety of specifications, pressure levels, stiffness levels or other special properties of the product, a wide range of applications. Since the glass fiber reinforced plastic product itself has good corrosion resistance, does not require anti-rust, anti-fouling, insulation, insulation, and other measures and maintenance, no need for cathodic protection of buried pipes can save a lot of maintenance costs.